John Philip Jacob Elkann (born 1 April 1976) is an American-Italian industrialist. He was the chosen heir of his grandfather Gianni Agnelli, and chairs and controls the automaker Fiat Chrysler Automobiles (which owns the Abarth, Alfa Romeo, Chrysler, Dodge, Jeep, Fiat, Fiat Professional, Lancia, Maserati, Mopar and Ram brands). He is the chairman and CEO of Exor, the holding company controlled by the Agnelli family, which also owns Partner Re and holds a controlling stake in Ferrari, CNH Industrial and Juventus F.C.. In July 2018, he was appointed as chairman of Ferrari after Sergio Marchionne had to leave due to health issues. Elkann was born in New York and holds both Italian and American citizenship. Born in New York City, John Elkann is the first son of Alain Elkann, a New York-born journalist and writer of French Jewish and Italian Jewish background, and his then wife Italian Margherita Agnelli. His parents divorced in 1981 and both have remarried. Elkann's maternal grandparents were the industrialist Gianni Agnelli and the Italian socialite Marella Agnelli (born Donna Marella Caracciolo di Castagneto). His paternal great-grand-uncle was the banker Ettore Ovazza. He has a brother, Lapo, and a sister, Ginevra, as well as five half-siblings from his mother's second marriage, as Margherita Agnelli de Pahlen, to Serge de Pahlen. His younger half-siblings are: Maria (born 1983), Pierre (born 1986), twins Sophie and Anna (born 1988) and Tatiana (born 1990). Elkann attended primary school in the United Kingdom and Brazil, before his family moved to Paris, where he obtained a baccalauréat scientifique at the State School Lycée Victor-Duruy in 1994. Later the same year, he moved to Italy to attend the Politecnico di Torino (Turin), where he graduated with a degree in management engineering in 2000. As a result of his international upbringing, he is fluent in four languages. While pursuing a degree in engineering, Elkann gained work experience through several internships: headlight plant in Birmingham, England (1996), production line in Tychy, Poland (1997), car dealership in Lille, France (1998) and also at GE's CIG (corporate initiatives group) where he worked on a thesis on e-auctions (1999). In December 1997, Elkann was selected by his grandfather Gianni Agnelli to take the place in the family business of Giovanni Alberto Agnelli, the son of Gianni's younger brother, Umberto, who had died at the age of 33. He was appointed to the Fiat board at the age of 21. In 2000, after graduating in Engineering from Politecnico di Torino, he joined General Electric's Corporate Audit program. He left General Electric two years later. He moved back to Turin to be closer to his ageing grandfather, as well as be closer to the family business. In 2003, he joined IFIL (now Exor) and worked on the turnaround of Fiat Group. Elkann was instrumental in the appointment of FCA CEO Sergio Marchionne, in May 2004. After the deaths of his grandfather Gianni Agnelli in 2003, and his great-uncle Umberto Agnelli in 2004, Elkann became vice chairman of Fiat and vice chairman of Giovanni Agnelli Sapaz (now Giovanni Agnelli B.V.), the family partnership controlling EXOR. In 2010, he became chairman of Fiat S.p.A. (now Fiat Chrysler Automobiles), succeeding Luca Cordero di Montezemolo, and chairman of the Giovanni Agnelli Sapaz, succeeding Gianluigi Gabetti [it]. In February 2011, he was appointed chairman and CEO of EXOR. He is also Chairman of Ferrari, Vice Chairman of GEDI Gruppo Editoriale S.p.a. and a board member of The Economist Group and Partner Re. He is Chairman of the Agnelli Foundation, a philanthropic institution supporting education. In 2013, he was included by Fortune in the world's most influential managers under the age of 40. In June 2017, to celebrate the 150th anniversary of Italian newspaper La Stampa, which was acquired by the Agnelli family in 1926, he organized "The Future of Newspapers", an international conference attended by Jeff Bezos (The Washington Post), Lionel Barber (The Financial Times), Tsuneo Kita (Nikkei), Jessica Lessin (The Information), Gary Liu (South China Morning Post Publishers), John Micklethwait (Bloomberg News), Zanny Minton Beddoes (The Economist), Mark Thompson (The New York Times), Robert Thomson (NewsCorp) and others. In February 2018, he featured as one of the protagonists on the podcast series by Reid Hoffman (Linkedin co-founder) Masters of Scale. In this interview he discussed the conditions which enable companies to last over centuries (using the metaphor of the "phoenix"), and described the case of Fiat, from the crisis of 2004 to the creation of the Fiat Chrysler. Elkann was baptized and raised Catholic. Elkann married Donna Lavinia Borromeo (born Lavinia Ida Borromeo-Arese on 10 March 1977 in Milan, Italy) a member of the prominent Italian aristocratic family the House of Borromeo. She is the daughter of Don Carlo Ferdinando Borromeo, Count of Arona (born in 1935), the son of Vitaliano Borromeo, 2nd Prince of Angera. They married in a Roman Catholic ceremony in the Cappella Bianca on Isola Madre, one of the Borromean Islands of Lake Maggiore. Since 2009 has been attending the annual "media and tech conference" organized in July every year by Allen & Co at Sun Valley, Idaho. He is also a regular contributor to the Google Camp, which every year gathers tech entrepreneurs, investors, representatives of institutions and pop stars in Sciacca, Agrigento and other places around Sicily. In June 2018 he invited Peter Thiel, Reid Hoffman, Xavier Niel and other global tech leaders to the SEI Torino Forum for the international launch of the new School of Entrepreneurship and Innovation of Turin, the initiative supported by the Agnelli Foundation helping university level students to start new businesses. ^ "John Elkann: Fiat's fresh face". www.fortune.com. 2013-07-08. ^ "Biografia di Rosi Greco". www.cinquantamila.it. 2010-04-28. ^ "Margherita Agnelli". www.thepeerage.com. 2005-09-29. ^ "Margherita Agnelli, * 1955". Geneall.net. Retrieved 2015-10-02. ^ "Person Page 16329". Thepeerage.com. Retrieved 2015-10-02. ^ "Edoardo Agnelli b. 2 Jan 1892 Verona d. 1935: Geneagraphie - Families all over the world". Geneagraphie. Retrieved 2015-10-02. ^ "Industrialist Heir to the Fiat Dynasty Chart His Course". www.nytimes.com. 2015-08-03. ^ a b "Testimonial - John Elkann, Presidente di FCA ed EXOR". Politecnico di Torino. ^ "John Elkann" (PDF). www.exor.com. 2017-10-16. ^ "John Elkann" (PDF). www.fcagroup.com. 2017-10-10. ^ "Elkann nel Cda Fiat a 22 anni". La Repubblica. 8 July 2013. ^ "John Elkann: How to build a company to last | Masters of Scale podcast". WaitWhat. Retrieved 2018-03-20. ^ "Dynasty calls". economist.com. Retrieved 25 July 2018. ^ "John Elkann: Fiat's fresh face". Fortune. 30 May 2004. Archived from the original on 15 September 2013. ^ "John Elkann" (PDF). www.exor.com. 2017-10-10. ^ "Press release - Exor announces new organizational structure" (PDF). www.exor.com. 2011-02-11. ^ "Ferrari – Management and Board". www.corporate.ferrari.com. 2017-10-10. ^ "GEDI Gruppo Editoriale - Governance". www.gedispa.it. 2017-10-10. ^ "PartnerRe – Management and Board". www.partnerre.com. 2017-10-10. ^ "Fondazione Agnelli - Consiglio di Amministrazione". www.fondazioneagnelli.it. 2017-02-06. ^ "Fortune's 40 under 40 — The hottest young stars in business". Fortune. 2013-09-19. Retrieved 2016-09-26. ^ "The Future of Newspaper". ^ "John Elkann: How to Build a Company to Last | Masters of Scale podcast". WaitWhat. Retrieved 2018-03-02. ^ "Lavinia Borromeo". Cinquantamila.corriere.it. Retrieved 2015-10-02. ^ "Lavinia Ida Borromeo-Arese, * 1977". Geneall.net. Retrieved 2015-10-02. ^ The Wedding of the Decade | Italian Lakes Wedding Planner. Italianlakeswedding.com. Retrieved on 2013-08-24 | Father Biagio Pizzi and Don Giuseppe Volpati presided over the ceremony. The church was adorned with white and yellow flowers. ^ "E' nato Leone, figlio di Jaki e Lavinia Inizia la sesta generazione Agnelli". La Repubblica (in Italian). 27 August 2006. Retrieved 28 September 2013. ^ "È nato Oceano Elkann". Il Corriere della Sera (in Italian). 12 November 2007. Retrieved 28 September 2013. ^ "È nata Vita, la terza figlia di John Elkann". Corriere della Sera. 24 January 2012. ^ "E' nata Vita la terzogenita di casa Elkann". La Stampa (in Italian). 25 January 2012. Retrieved 28 September 2013. ^ "John Elkann at Sun Valley Conference". ^ "Google Camp in Agrigento". ^ "SEI Torino Forum 2018". ^ "Fondazione Agnelli - School of Entrepreneurship & Innovation" (PDF). ^ "Ferrari - Governance". www.ferrari.com. 2018-07-21. ^ "Pinacoteca Giovanni e Marella Agnelli - Consiglio Direttivo". www.pinacoteca-agnelli.it. 2017-10-16.
Business Week: Who'll Take Over from the Patriarchs? 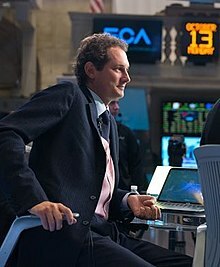 Wikimedia Commons has media related to John Elkann. This page was last edited on 16 April 2019, at 09:01 (UTC).